I love using fresh in season produce in my cooking. The blueberries this season are huge and bursting with rich juicy flavor. Well, I went overboard and bought tons of berries and had to use them up, this buckle is perfect and no one will pass up this crumbly cake. Blueberry Buckle can be served for breakfast or dessert with vanilla ice cream. Preheat oven to 375˙and grease a 9x13 inch pan. In a bowl stir together 1 cup of sugar, 3 cups of flour, and baking powder. Mix in salt and lemon zest. Cut your cold butter into small pieces and add with one egg to flour mix. Gently mix with clean hands. Your crust will be crumbly. Pay half of the dough mixture into the bottom of your pan. In another bowl, stir together 1/2 cup of sugar, 4 teaspoons of cornstarch and lemon juice. Add your fresh blueberries to this mixture and coat them. Spread the blueberry mixture evenly over the crust. Crumble the remaining dough over the berry layer. 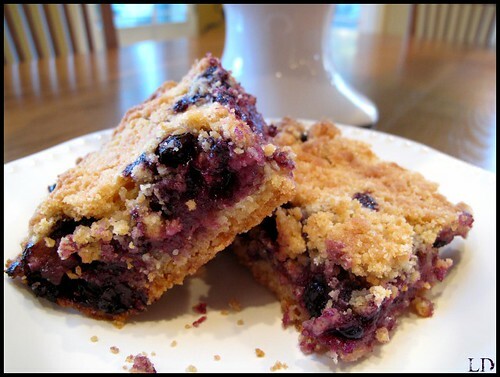 Bake your Blueberry Buckle for 45 minutes or until golden brown. Cool completely before cutting. This looks and sounds amazing! I am totally going to have to try this!! !